Million dollar view from this 2 bedroom, 2 bath condo on the beach. This beautiful unit is on the perfect floor to watch the dolphins, seagulls and activity on the beach from the large balcony, Watch the boats on the Intercoastal Waterway and have a front row view for holiday fireworks from the front walkway. Everything has been freshly painted. Master suite has a king sized bed, its own bath, closet and its own sliding glass door to the balcony. Guest bedroom has two twin beds with a connected bathroom. Kitchen is wonderful with a corian countertop breakfast bar with 3 stools, fridge with water and ice dispenser, garbage disposal, stove and built-in microwave. All cookware, utensils and dishes are provided, as well as a blender and toaster. Island Princess amenities include: heated gulf front pool, hot tub, picnic and barbeque area, exercise room, and complimentary daily beach service consisting of 1 umbrella and 2 chairs daily. And the best amenity, of course, is the gorgeous Gulf of Mexico with wide sugar-white beach and clear, emerald green water. Island Princess is one of the favorite destinations for families visiting the Emerald Coast. It's a mid-rise with only seven stories. In addition to the amenities on site, Fort Walton Beach (1 mile to downtown) and Destin (approximately 7 miles) are just a few minutes away. The balcony is a delight with comfy Polywood furniture (table and four chairs) and views that go on forever in both directions. Watch the dolphins frolic from the balcony! Saturday to Saturday reservations are preferred during peak season. We may be able to accommodate other stays so please ask! We stayed at Island princess last year and we were unable to get the same unit as it was already booked. We were able to get this unit and it was perfect! Everything in the listing was spot on and provided. We enjoyed the beach service which was included as well as an abundance of beach toys and 2 additional chairs. This unit also provided plenty of extra linens and beach towels which was a bonus. We will definitely be back and will choose this unit. Everything was perfect..The condo was very clean and comfortable, the view from the balcony was amazing!!! We would definitely stay there again! Kim Hughes you are awesome and Thank You for everything!!!!!! Beautiful condo with fantastic beach views! 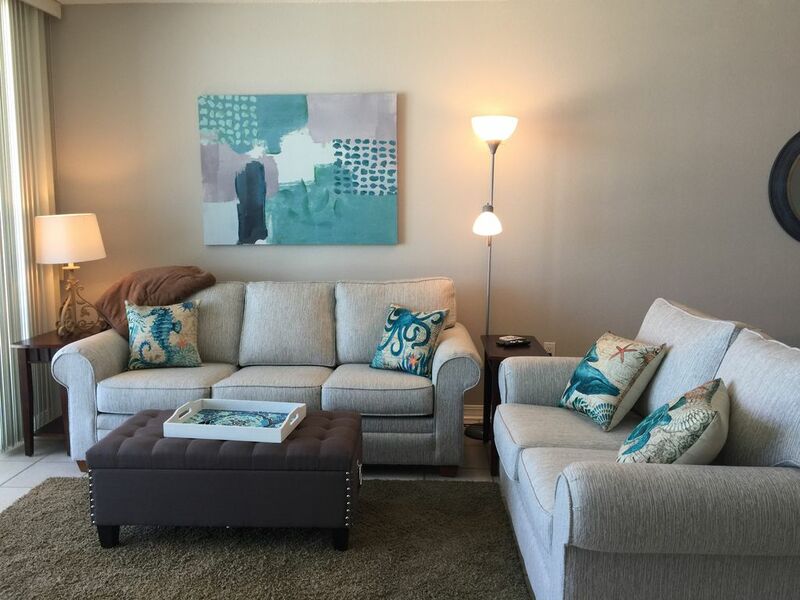 This condo was beautifully and tastefully decorated. The kitchen was fully stocked. The entire condo was clean. There is a nice balcony with a sturdy table and four chairs. The balcony view is directly to the beautiful beach! We would definitely stay there again!!! We spent a week at this condo just me and my husband and had a very enjoyable time. Kim, the property manager stayed in communication the whole time to make sure our stay was great. We did learn on the trip that island princess complex during busy season offers front beach seats and back row seating due to having so many condos. Neither us or Kim were aware that visitors get front back row beach seats unless you purchase additional equipment such as a table for 5.00 per day etc or extra seats etc. the beach guys apologized for not communicating this to visitors and all was taken care of by Kim. We highly enjoyed our stay and would definitely come back. Thanks Kim! Thank you, Natalie! It was a pleasure having y'all and I learned a little something about beach service! Let me know if I can help you in the future! Condo was as shown. No hidden surprises. Nicely located and the beach is easily accessed. Would stay again. Gulfarium and fishing pier are 1 mile away! Only the refundable security deposit is due at the time of booking. The rental amount is due 30 days prior to your arrival.